These five restored apartments are set in 15 hectares of enclosed grounds. They are on a country estate which has a 15th century pigeon tower and a number of rustic buildings. The estate is between Gubbio and Urbino and a few hundred meters above sea level. It is 2 km from the village of Cagli. There is a spacious garden, a swimming pool and a football field. A beautiful walking path winds beside a river for a few kilometres. Casa Le Volte is a very special apartment which occupies part of the antique pigeon tower and has beautiful round ceilings. The private terrace looks out over the garden and the swimming pool. The garden and the park offer plenty of opportunities for relaxation and for enjoying an active holiday. Cagli has a number of Romanesque churches and Renaissance buildings. There is a lively village square where you can experience typical Italian life. It is the ideal place to enjoy a cappuccino or an ice cream. The local population meet here in late afternoon and in the evening. They enjoy the benefit of the cool summer breeze. The small River Bosso, the River Burano and the waterfall just outside Cagli are refreshing and worth visiting. 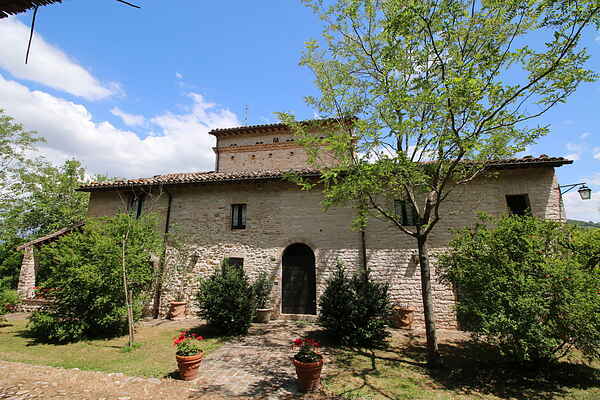 This holiday home is a few minutes walk from the historic town centre of Cagli. The home is near a road which allows easy access to the many places of interest in the area.